The start of a new year, time for new beginnings, and I know that non-art commitments are going to keep me very busy for the next six months at least. So I have decided that painting at least one little painting every day I can make it to the studio will keep things ticking over. It will also let me experiment quicker with my materials, with methods, with composition, paint application and colour - in short, with pretty much every aspect of picture making. So I have promised myself to paint a hundred paintings over the next hundred days. Most of these will be small oil studies although I will count bigger paintings and possibly drawings, depending on what I am working on as the time goes on. Each work only gets counted once, though, even if I spend more than one day on it. 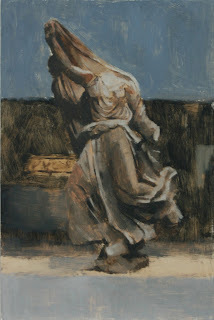 To start with the little studies will be museum interiors - like the lady dancing above, who is from the British Museum. This is because I have been thinking a lot about composition and depth recently, as well as looking at how different people have portrayed the human form previously. But who knows what I'll be painting by the end of the time! Anyway, I will be posting them (good and bad) here, facebook and at @glasgwjane on twitter. All encouragement very welcome! A great idea Jayne, a good challenge! I look forward to seeing what you produce! Thank you Clare - it's gonna be hard work, though - not really done much ala prima painting at all. Feels like I'm learning to walk all over again!